I’m thrilled to announce that my new book is almost out! You can pre-order it on Amazon! Find it at an independent bookseller at IndieBound! Read all about it at the Harvard University Press site! Available in July! Curators make many decisions when they build collections or design exhibitions, plotting a passage of discovery that also tells an essential story. Collecting captures the past in a way useful to the present and the future. Exhibits play to our senses and orchestrate our impressions, balancing presentation and preservation, information and emotion. Curators consider visitors’ interactions with objects and with one another, how our bodies move through displays, how our eyes grasp objects, how we learn and how we feel. Inside the Lost Museum documents the work museums do and suggests ways these institutions can enrich the educational and aesthetic experience of their visitors. Woven throughout Inside the Lost Museum is the story of the Jenks Museum at Brown University, a nineteenth-century display of natural history, anthropology, and curiosities that disappeared a century ago. The Jenks Museum’s past, and a recent effort by artist Mark Dion, Steven Lubar, and their students to reimagine it as art and history, serve as a framework for exploring the long record of museums’ usefulness and service. Museum lovers know that energy and mystery run through every collection and exhibition. Lubar explains work behind the scenes—collecting, preserving, displaying, and using art and artifacts in teaching, research, and community-building—through historical and contemporary examples. Inside the Lost Museum speaks to the hunt, the find, and the reveal that make curating and visiting exhibitions and using collections such a rewarding and vital pursuit. If you’re curious about museums: This book explains how they work, and how they came to be the way they are. Full of great historical stories and peeks behind the scenes of art, history, natural history, and anthropology museums. If you work in a museum, or would like to: this is the book I wish I had read when I started working in a museum. Museums are an odd mix of tradition and innovation, public and private, objects and audiences. They’re complicated places with many agendas. This book will help you understand what’s really going on. If you’re teaching museum studies: Students should understand both what museums do and why they do it. 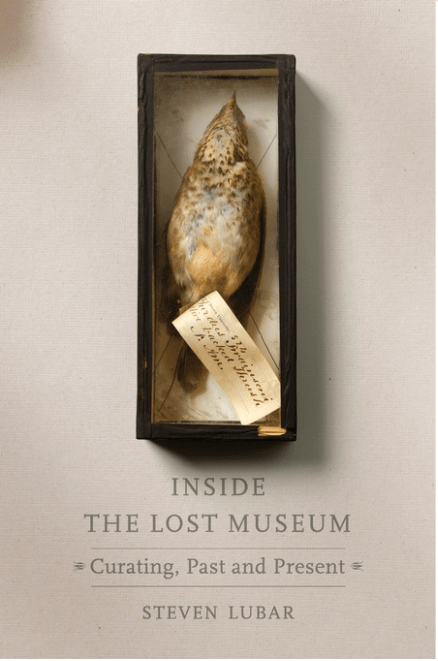 Inside the Lost Museum covers the work of curators, collections managers, conservators, designers, and educators. It explains both what they do and why they do it. It makes sense of museums by revealing their historical trajectory and their philosophical underpinnings. 15 What Use Is a Museum?